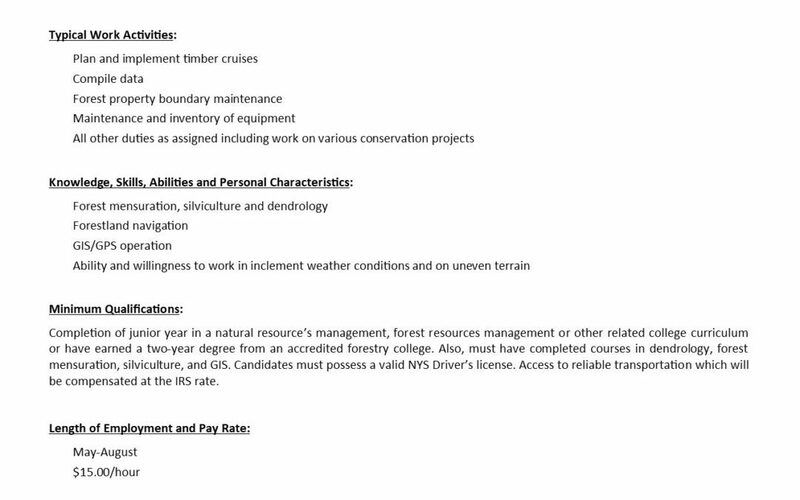 The District is seeking applicants for a Forestry Internship. The primary duties will include forest inventory on public lands, boundary maintenance, summarizing data, and developing timber cruise and stand maps. Interns may also be asked to perform basic checks of various conservation practices, conduct culvert assessments, and other work as assigned. Minimum Qualifications: Completion of junior year in a natural resource’s management, forest resources management or other related college curriculum or have earned a two-year degree from an accredited forestry college. Also, must have completed courses in dendrology, forest mensuration, silviculture, and GIS. Candidates must possess a valid NYS Driver’s license. Access to reliable transportation which will be compensated at the IRS rate. Internship period will be May through August 2019 at $15.00 per hour.